Meet residents Britt, Ivan, and Gabe Wibmer. Britt has been a real estate broker for the last 15 years and recently moved Britt Wibmer Real Estate Group over to Bellevue’s Avenue Properties. “I love what I do because I get to be a part of people’s real estate journeys, for both their primary homes and for their investment portfolios,” she says. PL: Where are you originally from? We are Pacific Northwest Natives! I was born and raised in Renton and then lived in nearly all of the Seattle neighborhoods while attending the University of Washington and beyond. I also spent a few years living in San Francisco. PL: Where do your children attend school? Ivan is a fifth grader at Medina Elementary, and Gabe goes to Eastgate Elementary where the Bellevue School District has the “Olympic” program, their autism program. He is a 4th grader there. PL: What kind of activities are they involved in? Both of the boys practice Judo and Jiu-Jitsu. Ivan loves skiing, inventing, shooting his Red Rider BB Gun (safely of course), and copious amounts of hot sauce. Gabe is a huge Pixar movie fan and loves riding his bike, playing with his trains, playing his guitar, and entertaining people. PL: What kinds of activities do you do to balance your home and work life? I am always aiming for a work-life balance. I’ll let you know when I’ve found it! I do love my morning routine--it’s my “me” time before the boys wake up. I get up around 5:30 a.m. and do my “Miracle Morning” as developed by Hal Elrod. I also love getting to Barre3 here in Bellevue whenever possible. The boys and I also like cooking our Blue Apron delivery, as it’s a fun activity that everyone gets behind. PL: What are some of your favorite family traditions? We have Pizza Tuesdays and always look forward to evening movie time. PL: Do you have a favorite homemade family meal you have regularly? We BBQ year round - it’s our favorite! PL: Where do you like to vacation? The boys and I love to travel. We always take a fun Spring Break trip to sunny places and, truth be told, I’m at least as much of an amusement park fan as the guys. We’ve gone to Universal Studios, Legoland, and Disneyland several times. Rancho Mirage, San Diego, Coronado, and Santa Monica are also top spots for us. We do a huge extended family vacation to Lake Chelan each summer, complete with 6 boys ages 11 and under. Last summer, the boys and I had an amazing time in Hawaii. We did 6 days in Maui and 6 days in Kauai. We zip-lined, drove an ATV through the jungle, and did a snorkel adventure to the Island of Lanai. PL: Do you have any favorite family TV shows or movies you enjoy? We are a movie-loving family! Right now, Indiana Jones, The original Jumanji, Back to the Future and Coco are in rotation. We all like Top Chef and American Ninja Warrior too. PL: Describe your family’s perfect Sunday. I tend to wake up early and read the Seattle Times (hard copy) with my coffee. Once the boys wake up, we have a relaxing morning, then get going to some sort of activity: Seattle Science Center, The Aquarium, bike riding, catching a movie. Then, having dinner with my parents who are a huge part of our lives. We’re so blessed to have them. PL: What is your family’s favorite holiday and why? We love Christmas! The festivities kick off with a trip to the tree farm where Ivan cuts our tree (with a little Grandpa or Uncle Kenny assistance). My sister and her family fly in from Amsterdam and it’s just so wonderful to have everyone together. Of course, watching the excitement of the kids on Christmas morning is the huge highlight for me. PL: What are some of your favorite things to do together locally in the area? We are members at Kids Quest, we love biking the 520, Seattle Children’s Theater, and hanging out with friends. PL: What do you like most about living in the neighborhood? Raising my sons in our area has been the best thing I could have ever done for us. I feel so blessed to have found a community full of family-first people who share my mindset of raising kids who are kind and are good friends to others. I love it that when my son is riding his bike to the Green Store I’ll get a couple of text messages from people who spotted him on his journey. PL: Name one thing you are passionate about? My youngest son, Gabe has autism. After months of research and visiting many schools throughout our region, I knew that the Bellevue School District was where we needed to be. Honestly, it was like the moon and the stars aligned for us that we ended up in Medina in 2013 on a safe, flat street with very little through traffic - all critical elements for me since Gabe loves speed and throws caution to the wind with just about everything. It was from that wonderful home that we started creating this beautiful community of friends and neighbors who embrace our perfect little unconventional unit, and I couldn’t be more grateful to have landed just where we need to be. 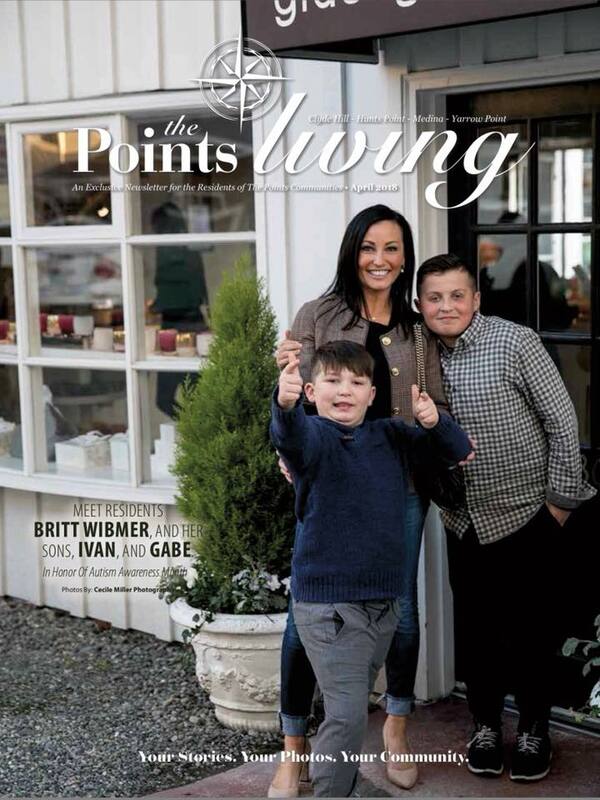 My purpose is to increase autism awareness and spread compassion for families affected by autism, so I’m ecstatic that my family was selected to be The Point’s Spotlight Family for April, which is Autism Awareness month. I spent years struggling with his tantrums and behaviors both at home and in public places, which was incredibly isolating and defeating. Before experiencing having a child with autism, I would have probably been the person in the grocery store judging the challenged parent with the misbehaving child. Now, I’ve made it my goal to open people’s minds and hearts about autism so that the next time they come across that grocery store scene, they offer to lend a hand or give a word of encouragement. World Autism Awareness Day is April 2nd, and I’m thrilled to be partnering with Bellevue Glassy Baby for a “Light it up Blue” shopping day from 10 a.m.-7 p.m., with 10% of the proceeds going to local autism charities.